This Carte de Visite portrait features an adorable little boy. He is dressed in a very cute outfit for his day at the photo studio. Note his wonderful hat. He is standing next to a table holding an open book. Having viewed thousands of cdv’s and cabinet cards, it is clear that books are among the favorite props used by photographers during that era. The photographer who took this cdv photograph is from the Ph. & E. Link studio, which was located in Zurich, Switzerland. Zurich is the largest city in Switzerland. This carte de visite photo is in very good condition. This cabinet card features a well dressed and attractive couple flanking their young daughter in a family portrait produced by the Photo Express gallery in Geneva, Switzerland. Dad seems to be a pro at posing for a photographer judging by the air of confidence that he exudes in this photograph. The gentleman’s daughter seems a bit apprehensive about her day at the photography studio. It is interesting to note the name of the studio that produced this image. “Photo Express” is a name we might expect to see in today’s time rather than around the time of the cabinet card era. We live in a time which has an “instant gratification” mentality. I suppose that the “Photo Express” name tells us that people have had an “on demand” type of impatience long before present times. This cabinet card joins a number of other Swiss images in the Cabinet Card Gallery. To view these photographs, click on the category “Switzerland”. 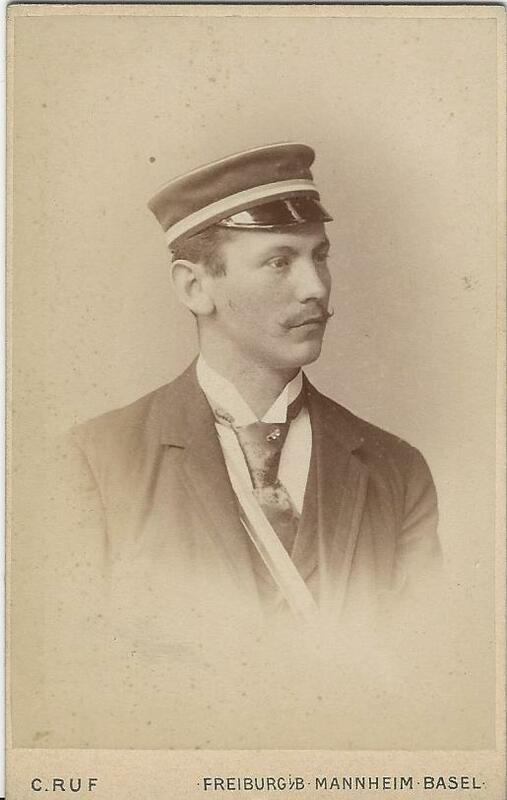 This Carte de Visite features a uniformed young man posing at the Cruf Studio which had galleries in Freiburg, Mannheim, and Basel. The first two cities are in Germany and Basel is located in Switzerlan. An inscription on the reverse of the photograph indicates that the subject is H. Wolff. Mr Wolff is wearing a uniform representing an unknown group. Perhaps he is a student or maybe he works for the railroad. His group affiliation remains unknown for the time being. Looking at the reverse of the photograph also reveals that the Cruf Studio won a number of medals at photographic competitions. The latest medal listed was recieved in 1888 which means that this image dates back to 1888 or later. 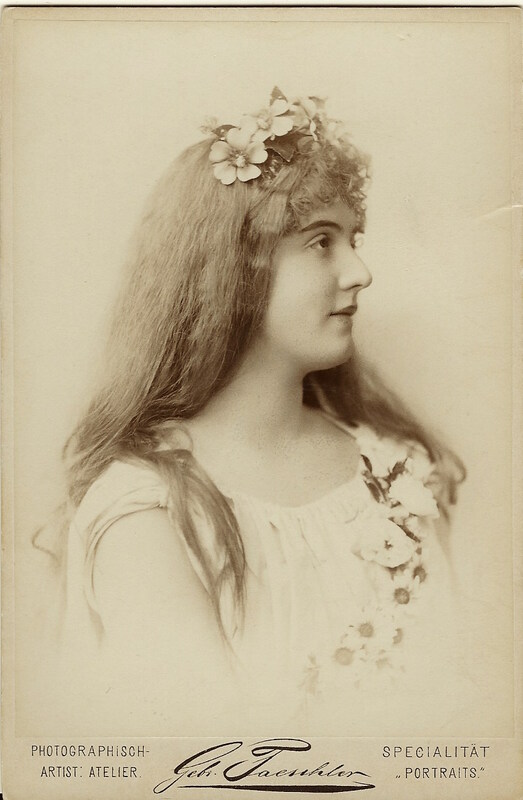 This cabinet card portrait features a pretty long haired woman flashing a nice smile. An early seventies song espoused that if you go to San Francisco, be sure to wear flowers in your hair. 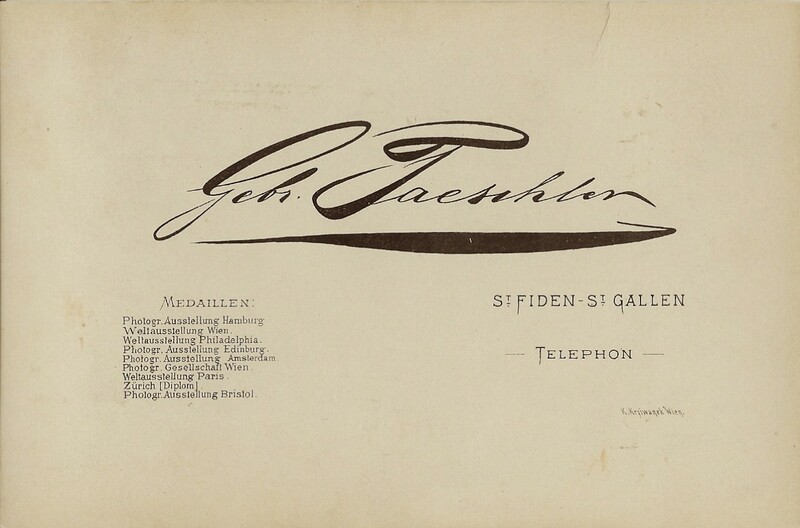 The subject of this photograph was not in San Francisco but instead in either St. Fiden or St. Gallen, Switzerland at Taeschler Brothers studio. The Taeschler’s were a family of photographers that dominated the photography business in their region for more than 60 years. The photographers spanned at least three generations. The founder of the firm was Johann Baptist Taeschler (1805-1866) and he began working with daguerreotypes during the most early days of photography. 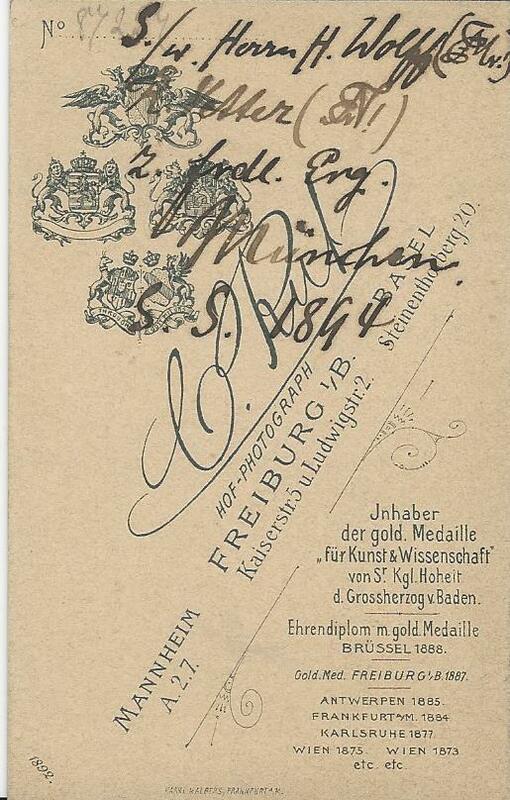 The firm won medals from around the world illustrated by the list printed on the reverse of the cabinet card. 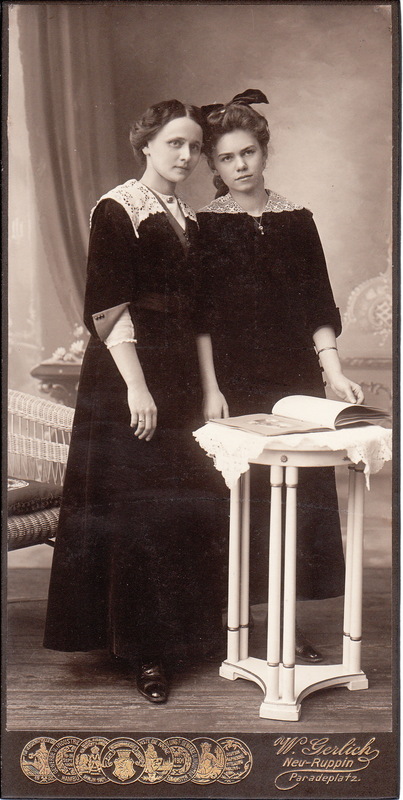 Two lovely young women pose next to an open picture book which is sitting atop a stool-like table. The woman are nearly identically dressed. Their style of fashion is conservative. Their heads are close to each other and tilted toward each other. This pose suggests that there is some intimacy between them. Perhaps they are sisters. The photographer of this image is W. Gerlich and some of his photography medals are exhibited at the bottom front of this photograph. The medals are from exhibits held in 1900 and 1901 and this image likely was produced shortly after that time. W. Gerlich conducted his photography business in “Neu Ruppin”, which was a Prussian town in Brandenburg, Germany. The studio was located on a street named for “Paradeplatz”, or Parade Square, which was located in downtown Zurich, Switzerland. 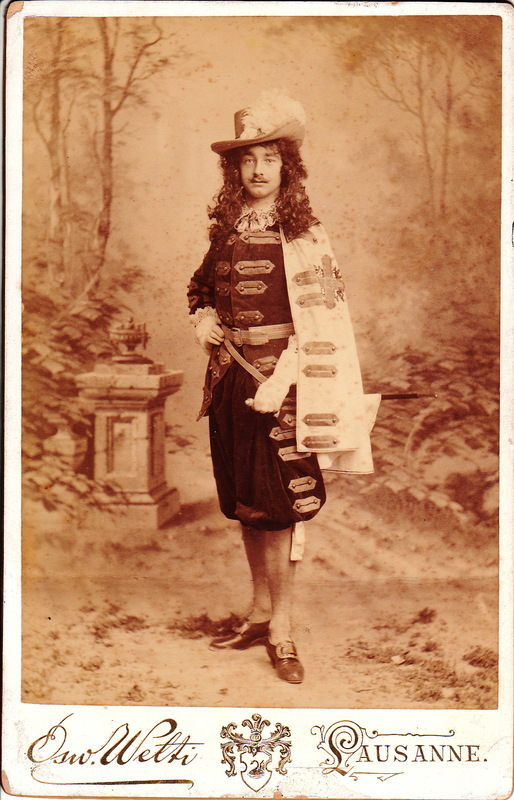 This cabinet card captures an actor in costume. He is dressed like a musketeer. Note those long tresses. It is difficult to decipher the photographers name. It may be Oswald Wetti, but that is just a guess. The photographer’s studio was located in Lausanne, Switzerland. Lausanne is a city in French speaking Switzerland. The city lies on the shore of Lake Geneva. 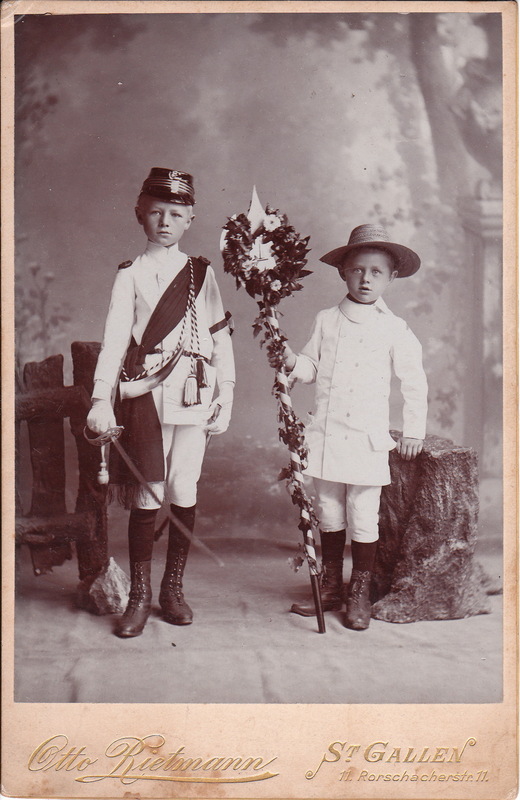 Two boys are dressed in what appears to be military style, as they pose for photographer Otto Rietmann in St. Gallen, Switzerland. The older boy is holding a sword and wearing a gun powder horn. The younger boy is holding something that looks like a decorated lance. Perhaps a visitor to the cabinet card gallery can add additional information about this image.